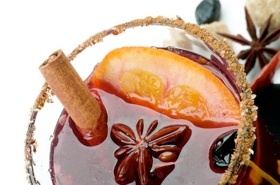 Served at our January 2013 Wine, Tea & Cheese pairing Tea Party, we had great feedback on our Mulled Wine so we’ve decided to share our recipe with you! In a large pot on the stove on high bring 1 bottle of Pinot Noir to boil. Reduce heat to medium and add 1 cup of orange juice, 1/2 cup of water, 1/2 cup of brown sugar, 3 cinnamon sticks and 1 very full tea pocket of Tea Time in Cayman’s Christmas in Cayman loose leaf tea. Simmer for 15 minutes, remove cinnamon sticks & tea for a balanced flavour. Will make 4-6 servings. Don’t forget to add a couple slices of fresh oranges!